When the biotechnology market hit a speed bump in early 2014, every stock in the sector was jolted. Large-cap biotech and big pharma have largely recovered, but small- and micro-cap companies haven't yet entirely recouped the losses. The performance of Streetwise Reports' Biotechnology Watchlist to date reflects this trend: The portfolio lingered in negative territory after the late-winter punch, and hovers near breakeven as of Nov. 3. To get a handle on the drivers of small-cap stock price volatility, The Life Sciences Report turned to a pair of the analysts who selected companies for the 2014 Watchlist, John McCamant of the Medical Technology Stock Letter and George Zavoico of MLV & Co. In this recap, the two experts offer updates on the companies they selected for the portfolio. What's Up with the Down? The biotech indices all took a hit at the beginning of the year, but the major indices, such as the NASDAQ Biotechnology Index (IBB), which is up about 30% year-to-date, have since rallied. Small- and micro-cap companies, like those on the Watchlist, haven't been so lucky. The Life Sciences Report asked McCamant for his thoughts on what might be behind the market volatility, and he sent along his reflections as noted in the September 2014 issue of his Medical Technology Stock Newsletter. "Wide swings in biotech stocks are common," McCamant wrote. "But after the early-year debacle and the subsequent resumption of the sector rally, it can become rather frustrating that share prices can retreat so quickly despite a slew of positive fundamental events." This sentiment applies to companies on the Biotech Watchlist. "Biotechnology stocks appear stuck in a trading range," McCamant observed. But, "based upon exceptional fundamentals and overwhelming catalyst calendar" he expected stock prices to hold steady. "Leaders lead, and the Big Caps are often the first to recover." He cited sector leader Gilead Sciences Inc. (GILD:NASDAQ) as an example: Though news flow surrounding pricing of its hepatitis C blockbuster Sovaldi was less than stellar and the company also suffered "a Phase 2 disappointment in pancreatic cancer," Gilead has "recouped a majority of the downturn." Steve Hansen, associate editor at BioCentury, observed the following in the publication's Q4/14 preview, published Oct. 6: "The recovery of the biotech indices from their spring swoon was driven almost entirely by the large-cap names. Buysiders will therefore look to add to returns before year-end by cherry-picking in the small- and mid-cap space, where prices have continued to drift." With regard to prospects for an upswing that could bolster small- and mid-cap sectors, Hansen wrote: "The fourth quarter will bring plenty of data to chew on, but few major clinical milestones and, importantly, no binary events that carry significant negative risk for the sector." According to BioCentury, the "hardest hit market segment in Q3/14 [was] small caps between $200–499 million ($200–499M), which were off 13.6% for the quarter and down 6.4% year-to-date." On the upside, the publication noted that investors it spoke with "don't see any major risks that could derail the sector's performance before 2015, when expected product launches could add fuel to the drug-pricing fire." Looking back to forecasts for 2014, anticipated market drivers included catalyst-driven stock price movement and strong financings. Asked if catalysts continue to drive stock movements in the biotech market, McCamant asserted that mergers and acquisitions (M&A) are one of the biggest catalysts for biotech stocks, noting that M&A "fueled the sector's end-of-summer rally." M&A also got a mention at the BIO Investor Forum in San Francisco in early October; in his remarks at the conference's opening plenary luncheon, BIO President and CEO Jim Greenwood commented on the $80M in deal-making tallied year-to-date. Asked whether financing is still strong for smaller-cap companies, McCamant noted that "the financing calendar remains extremely full (and therefore a bit scary), as the deal players and traders search for the 'haves' and 'have nots.' Volatility remains extreme." "We believe that Omeros Corp. will become profitable in 2016." At the BIO Investor Forum, Greenwood noted that with more than 60 IPOs tallied in the U.S. to date, 2014 was on track to exceed the all-time IPO high for the sector, set in 2000. In addition, venture capital (VC) investment year-to-date totaled $1.8 billion in 122 deals, making biotech the second largest sector in terms of VC investment. Greenwood also noted that 1,400 partnering events were taking place at the San Francisco event, another sign that, despite volatility, investor interest in the small-cap segment of the sector remains strong. In McCamant's view, two characteristics stand out in the current environment. "First, non-fundamentalist investors—traders, generalists, M&A seekers—joined the party after the InterMune takeover by Roche Holding AG (RHHBY:OTCQX), and, as a result, a pullback was due," he wrote. "These incremental players often enter at the top of a cycle, create temporary short squeezes, and stay for a very brief period of time—until stock charts stop going up or because of the lack of a follow-up deal." The second characteristic is that biotech has become a stock-pickers' market, "[H]ence the standout performance of selective stocks based on unexpected news." Asked about the companies they'd selected for inclusion in the 2014 Watchlist, both McCamant and Zavoico provided written assessments of the status of their picks. We'll start with Zavoico. While Cerus Corp., maker of a blood pathogen inactivation technology called the INTERCEPT Blood System, suffered a setback earlier this year when its distributor relationship with the Spanish pharmaceutical company Grifols for Spain, Portugal and Italy ended, the company has since established its own direct sales force in Spain and Portugal, Zavoico wrote. Having achieved positive milestones and with upcoming catalysts, the analyst expects the company's revenue growth to rebound in H2/14. In addition, Zavoico expects regulatory approval of the company's INTERCEPT plasma and platelets systems in Canada and the U.S. by mid-2015. Cerus' investigational device exemption has been approved by the U.S. Food and Drug Administration (FDA), allowing the company "to design a clinical trial of its INTERCEPT platelets system that would make it available for use in regions of the U.S. with outbreaks of chikungunya and dengue viruses," Zavoico explained. FDA's familiarity with the "accumulated evidence from years" of the INTERCEPT system's use outside the U.S., "bodes well for a favorable decision by the FDA" on approval. 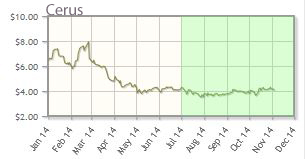 Cerus' shares are down about 33% year-to-date; the company's market cap is about $315M. Sales revenue of Cytosorbents Corp.'s cytokine absorbing column, CytoSorb, for the treatment of critically ill patients experiencing cytokine storm, increased substantially quarter-over-quarter in 2014, according to Zavoico. "We attribute this robust revenue growth to a growing appreciation of CytoSorb's efficacy in territories where it is commercially available and under continuing evaluation; to Cytosorbents' opening up and expanding new markets; [and to] publication of research highlighting the clinical benefit of using CytoSorb intraoperatively during cardiac surgery, as well as of case reports of CytoSorb's use leading to a favorable outcome." Near-term catalysts for the company include presentations from 40 investigator-sponsored clinical trials currently underway in Europe within the next 12 months, Zavoico noted. "Another important near-term catalyst is Cytosorbents' publicly stated intent to uplist to the NASDAQ market before year-end, and to file an investigational device exemption (IDE) application with the FDA to commence a pivotal Phase 3 trial of the use of CytoSorb during cardiac surgery in the U.S." Zavoico also expects the company to expand into more markets by establishing additional strategic partnerships within the next year. 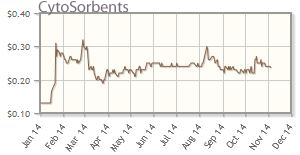 CytoSorbents' shares are up about 79% year-to-date; the company's market cap is about $73M. The most notable event for Omeros this year was the FDA's approval of Omidria, an irrigation solution to prevent intraoperative pupil constriction (miosis) during cataract and other intraocular lens replacement procedures, and to reduce postoperative pain. "We believe Omidria will have a successful launch and become widely used by ophthalmic surgeons," Zavoico said, "and that Omeros will become profitable in 2016. . .Key catalysts with Omidria will be the success of the launch and growth in sales revenue from quarter to quarter. While Zavoico believes Omidria "by itself is enough to keep a company busy and prosperous, we think that Omeros' diverse and promising drug pipeline has even more potential." The company recently suffered a setback when it halted its Phase 2 trial for its selective phosphodiesterase 10 (PDE10) inhibitor, OMS824, in Huntington's disease, but Zavoico, in a note issued on Oct. 22, noted that he expects the trial to resume once the issue is resolved, and reiterated his belief that OMS824 is safe. Earlier in the year, Omeros reported positive results from a Phase 1 trial of its complement inhibitor, OMS721, which addresses human atypical hemolytic uremic syndrome, an orphan indication, and other thrombotic microangiopathies. Now in Phase 2, top-line results from this trial are expected by the end of 2015. 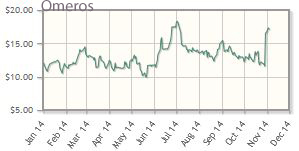 Omeros' shares are up about 50% year-to-date; the company's market cap is about $577M. OncoGenex suffered a major setback in April when its randomized, open-label Phase 3 SYNERGY trial of custirsen in combination with docetaxel as first-line therapy in men with metastatic castrate-resistant prostate cancer (mCRPC) missed its primary endpoint, Zavoico said. The failure of SYNERGY, in Zavoico's words, "casts doubt on the success of two other ongoing trials," both in Phase 3. "Positive results from either or both of these trials would revive interest in custirsen and restore value to the company," Zavoico noted. "Fortunately for OncoGenex, custirsen is partnered with Teva Pharmaceuticals in a global collaborative development and commercialization deal," and Teva is continuing to fund the two Phase 3 studies. "OncoGenex's other potential value driver is apatorsen (OGX-427), an antisense oligonucleotide that targets heat shock protein 27 (Hsp27), which is elevated in many types of cancer," Zavoico wrote. Six Phase 2 clinical trials of apatorsen in combination with established chemotherapy are ongoing, the analyst noted, with top-line results expected starting in early 2015 and continuing into 2016. 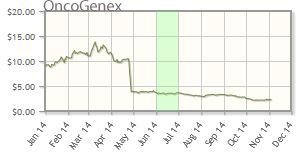 Oncogenex's shares are down about 71% year-to-date; the company's market cap is about $51M. In Anthera Pharmaceuticals Inc.'s Q2/14 earnings release, the company stated that the CHABLIS-SC1 clinical study of blisibimod in systemic lupus erythematosus would continue following its second interim data and safety review. McCamant noted, "More than 50% of the targeted 400 patients have been enrolled. Importantly, these patients have demographics and disease characteristics that are consistent with the targeted population. . .In our view, this is an encouraging view of [blisibimod] in the most recent clinical trial to date. [A] second lupus registration trial, CHABLIS-SC2, has been submitted to the FDA. The stock has been under pressure of late as the company ended the quarter with $23M in cash, hence it will need to raise additional funds soon." 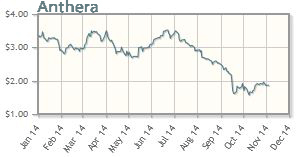 Anthera's shares are down about 41% year-to-date; the company's market cap is about $43M. For Incyte Corp., Q2/14 revenues for Jakafi (ruxolitinib), approved for treatment of myelofibrosis, reeled in $84M in sales versus a Wall Street consensus of $78.5M, McCamant noted. "Jakafi growth is being driven by demand from the recent long-term data presented at the American Society of Clinical Oncology (ASCO) meeting, and the recently expanded label," the newsletter writer explained. Another catalyst is the company's upcoming launch of Jakafi as a treatment for polycythemia vera (PV); McCamant noted the PV approval remains on track for Q4/14, with the company's supplemental new drug application accepted and granted a priority review, with a Prescription Drug User Fee Act (PDUFA) date set for Dec 5. McCamant also noted that the company has signed its fourth collaboration for its indoleamine dioxygenase-1 (IDO1) inhibitor INCB24360, this time with Roche, which means "IDO has attracted combo studies/collaborations with all the major immune oncology players—BMS, Merck, AZN and now Roche. . .In our view, the breadth and speed of these four partnerships, with all the major players stepping up, provides initial validation that INCB24360 has significant potential in the red hot sector of immune oncology. In addition, baricitinib, an often-overlooked asset that Incyte opted in to fund more rights from partner LLY, is due to report Phase 3 results in rheumatoid arthritis by the end of 2014 or early in 2015." Incyte's shares are up about 32% year-to-date; the company's market cap is about $11.3B. Novavax is enrolling a Phase 2 trial of its respiratory syncytial virus F-protein nanoparticle vaccine candidate (RSV F vaccine), in healthy women in the third trimester of pregnancy, McCamant wrote. "This is a major vote of confidence from the FDA, as [the agency is] very concerned about vaccine safety and even more vigilant when testing in healthy pregnant woman." The goal of this trial is to evaluate the safety and immunogenicity of the RSV F vaccine in the group, and assess the impact of maternal immunization on infant safety and RSV-specific antibody levels in infancy. "Initiation of this trial represents a watershed event for Novavax and its promising RSV vaccine," McCamant noted, adding that the company "continues to deliver on project timelines. . .This watershed event may also open the door to a potential partnership, as the vaccine has now been significantly derisked." In addition, McCamant looks forward to "a major 2015 news flow, when Novavax will reveal the results of at least four clinical trials, including the RSV pregnancy trial." 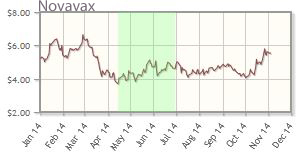 Novavax's shares are up about 7% year-to-date; the company's market cap is about $1.3B. 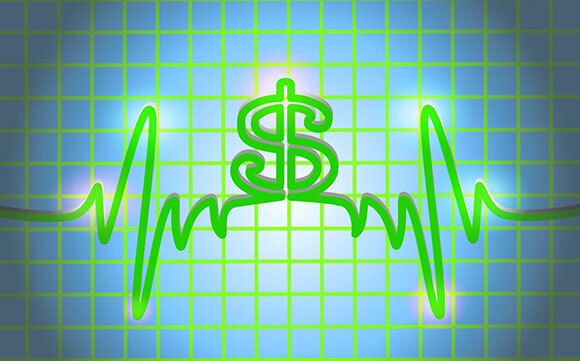 "In our view, Pharmacyclics Inc. remains undervalued," McCamant advised. "In January, Wall Street consensus sales estimates for Imbruvica (ibrutinib) for 2014 were ~$210M, and the company's stock price was ~$140/share. 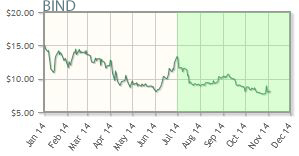 Today consensus estimates for 2014 are for ~$475M, and the stock is around $129/share. Enough said. . .In our view, consistent, better-than-expected Imbruvica sales, clinical data and pipeline updates will soon lead to a technical breakout." 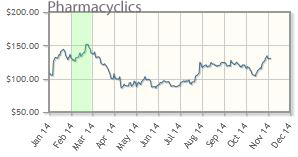 Pharmacyclics' shares are up about 22% year-to-date; the company's market cap is about $9.7M. Here are brief recaps of company news for the other Biotech Watchlist selections. BIND Therapeutics uses targeted therapeutics (Accurins), developed via the company's nanoengineering platform, to address cancer. Data from two Phase 2 trials for BIND-014 (PSMA-targeted docetaxel), one in prostate cancer and the other in non-small cell lung cancer, are expected before the end of the year. In late September, the company announced approval from the FDA for use of oral Otezla (aprelimast) for moderate to severe plaque psoriasis. 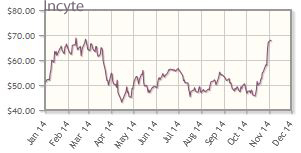 BIND Therapeutics' shares are down about 47% year-to-date; the company's market cap is about $132M. Celgene, a mid-cap darling, has a robust pipeline and a number of catalysts on the horizon, as well as an arsenal of marketed products, including marquee drug Revlimid (lenalidomide), approved for treatment of multiple myeloma. The company addresses a number of indications, including cancer, immunological and inflammatory diseases, and cellular therapies. 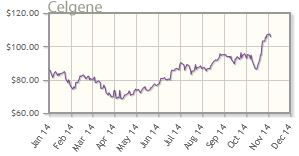 Celgene's shares are up about 26% year-to-date; the company's market cap is about $85B. Targeting cancer with monoclonal antibodies and immunotherapies, Celldex Therapeutics' lead product is a therapeutic vaccine for brain cancer called rindopepimut. The company's pipeline includes targeted therapies in indications with high levels of unmet need. 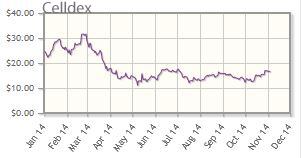 Celldex's shares are down about 31% year-to-date; the company's market cap is about $1.5B. Verastem's pipeline therapies inhibit the signal pathways used by cancer stem cells, with the most advanced trials in mesothelioma, lung, and ovarian cancers. The company announced interim data for its solid tumor product in Q1/14. 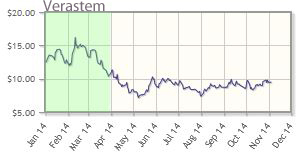 Verastem's shares are down about 18% year-to-date; the company's market cap is about $241M. Dr. George Zavoico, managing director and senior equity analyst at MLV & Co., has more than 10 years of experience as a life sciences equity analyst writing research on publicly traded equities. His principal focus is on biotechnology, biopharmaceutical, specialty pharmaceutical, and molecular diagnostics companies. He received The Financial Times/Starmine Award two years in a row for being among the top-ranked earnings estimators in the biotechnology sector. Previously, Zavoico was an equity research analyst in the healthcare sector at Westport Capital Markets and Cantor Fitzgerald. Prior to working as an analyst, Zavoico established his own consulting company serving the biotech and pharmaceutical industries, providing competitive intelligence and marketing research, due diligence services and guidance in regulatory affairs. Zavoico began his career as a senior research scientist at Bristol-Myers Squibb Co., moving on to management positions at Alexion Pharmaceuticals Inc. and T Cell Sciences Inc. (now Celldex Therapeutics Inc.). Zavoico has a bachelor's degree in biology from St. Lawrence University and a Ph.D. in physiology from the University of Virginia. He held post-doctoral fellowships at the University of Connecticut School of Medicine and Harvard Medical School/Brigham & Women's Hospital. He has published more than 30 papers in peer-reviewed journals and has coauthored four book chapters.